As the Cops film crews roll with deputies from the Sonoma County Sheriff's Office (SCSO), there is growing pushback against the controversial reality TV show's sudden arrival in the county last week—and questions about whether the Santa Rosa Police Department will ride along with the plan. After an SCSO-led media push celebrated the show's arrival last week, with multiple outbreaks of the show's theme appearing in the Press Democrat and KSRO, local elected officials are now questioning the wisdom of allowing film crews into a region hammered by the October wildfires and continuing to deal with fallout from the shooting death of 13-year-old Andy Lopez in 2013. All of that, and it's an election year, too, which will see the first contested sheriff's race in more than two decades. Sonoma County Supervisor Lynda Hopkins represents the part of the county where Lopez was shot by a deputy who remains on the force as a lawsuit against the SCSO and Sonoma County drags on. She wonders if Cops is in the best interest of her constituents. "Given the heightened anxiety in our community in the wake of the fires, going through a sheriff's candidacy and election process," she says, "I would question anything that could disrupt the fragile peace that we have right now in general." It's unknown at press time whether the Santa Rosa police will sign a contract with Langley Productions, the Santa Monica–based production company that produces Cops. Santa Rosa Police Chief Hank Schreeder is meeting with Santa Rosa City Council members this week and taking the pulse of the community before he makes a decision, say city council members, the city manager's office and a spokesman for the city police force. "They are still in the planning phase as far as the contract goes," says Santa Rosa police Lt. Rick Kohut. He says Schreeder might decide to pull the plug on Santa Rosa's participation in the program. "I would say that it is a possibility," Kohut says. At issue is the content of the contract and the extent to which it gives the Santa Rosa Police Department (SRPD) latitude to participate in the editing of the show. The SCSO contract signed in March gives the sheriff's office final say over what clips are used. And, says Kohut, the chief is aware of the show's controversial history of portraying policing in starkly "black-and-white" terms—often literally—and how such portrayals might be viewed as counterproductive to effective policing. "We absolutely want to avoid that," Kohut says. But can they? Even as Langley Productions was emailing the SRPD and SCSO to solicit their interest in participation in January, the Marshall Project criminal-justice organization produced an investigative feature on Cops that declared it the "most polarizing reality show in America." That's a message city officials are hearing as they meet with Schreeder this week to figure out whether to sign on with Cops. Cops follows a general formula that features an opening bit of action, some reflection in the police cruiser and more action to close out the episode. The stock-in-trade of the long-running show is the foot chase. It makes for great television—but does it provide a fair depiction of the communities where Cops has filmed? "Our city image has already been negatively impacted by the fires," says Santa Rosa council member Julie Combs. "Tourism is already down. We don't need an unearned and exaggerated portrayal of violent crime too. I'm not sure what the city is getting out of having such a polarizing program filmed here, especially since I don't think the show is compensating the department, even though they are making money off of it." Law enforcements agencies receive no financial benefit from the show's producers. Santa Rosa Assistant City Manager Gloria Hurtado says the city is waiting on the chief's recommendation before deciding how to proceed. His recommendation, she says, will "weigh heavily." "The chief is doing due diligence, asking for additional information and deciding whether this is the right thing to do at this time." That's not how the Cops producer envisioned the run-up to the show's episodes set in Santa Rosa and Sonoma County. An email exchange between producer Zach Ragsdale and the show's public relations firm the Lippin Group provides insight into what Cops' producers had hoped would happen. The original plan was for the SRPD and SCSO to roll with the cameras at the same time. It's unclear what would become of the sheriff's office's participation if the SRPD decides to pull the plug on Cops. Cops has come under fire for its portrayals of racial basis. In 2013, the civil rights group Color of Change successfully pushed Fox to drop the program based on its claim of persistent racial bias. It's now on the Paramount Network. The show has changed channels, but not its treatment of race, says Arisha Hatch, Color of Change's managing director of campaigns. She ran the Fox campaign for Color of Change in 2013. "Our concerns about the show then are the same as our concerns about the show now." Hatch says that she wouldn't expect any episode of Cops filmed in Sonoma County to be an accurate portrayal of the criminal-justice system there, "because it's just not set up that way. . . . It has been kind of a [public relations] machine for police departments across the country for several decades now." The Bohemian emailed questions to Langley Productions about racial bias, the status of the contract with SRPD and what role, if any, last year's fires played in the selection of Sonoma County. 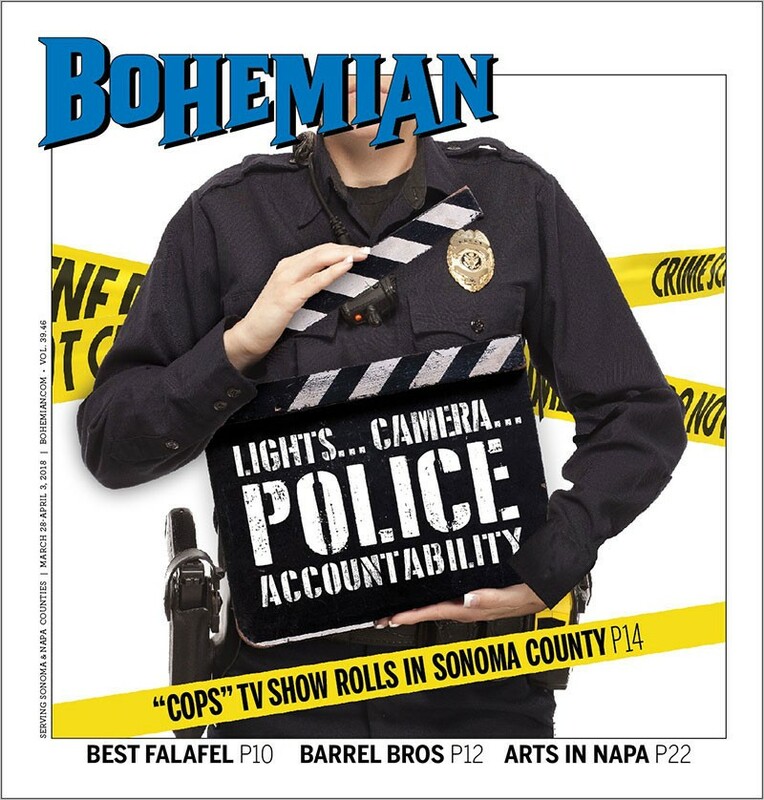 An email exchange inadvertently sent to the Bohemian between Ragsdale, who signed the SCSO contract on behalf of Langley Productions and is the point person on a presumptive SRPD contract, and the show's PR firm revealed some of the producers' thinking.